This is a sponsored post. I received a free product in exchange for my honest review. All opinions are my own. I did not receive any other form of compensation for this post. I've openly talked about my personal mental health story on my blog. I don't think I've been entirely clear about the fact that mood is always variable, even when you feel like you've got your emotions under control. In the free newsletter I emailed yesterday, I shared a story that explains my most recent episode of feeling downhearted. I was in low spirits. I also knew that I wanted to feel better. The problem is, you don't always know how to feel better. 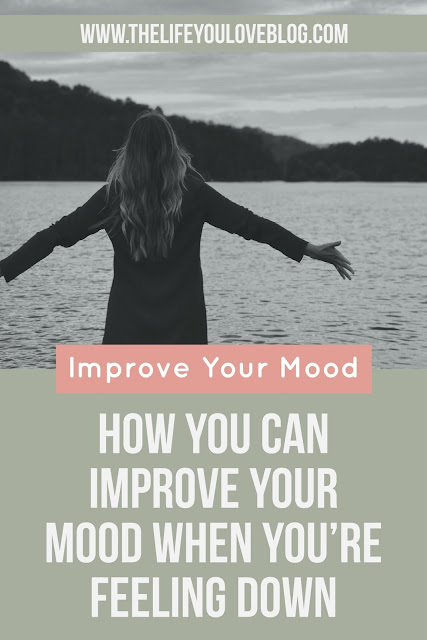 And when you're upset, it's more difficult to think about or do things that will improve your mood. Today, I'm sharing my favorite ways to feel better even when I'm feeling down. Remember, I'm not your therapist and I'm not offering you any professional guidance. I'm simply sharing my experiences and the techniques that I use that work for me. If you need professional mental health and you're experiencing negative emotions that feel like they're more than feeling "blue" or "down," I highly recommend seeking professional help! Make yourself feel pretty. Whether that means doing your hair and makeup, throwing on a pretty dress (like the one I'm wearing), or having a spa day, you deserve to feel beautiful and pampered. Studies show that when you feel better about your appearance, you'll feel better overall. If you're struggling to love your appearance, check out this article that shares 10 ways to feel better about how you look. Get out of the house and spend time with others. When we're feeling blue, we're more likely to isolate. That happens when we withdraw from social interactions and other people. Sometimes you need to have time for yourself and that's fine. The problem with "alone time" is when you're completely avoiding socialization and when it becomes a habit. That will only lead to more negative emotions. Eat foods that improve your mood. Oh, yes. This is an excuse to eat carbs and dark chocolate no matter what kind of food plan you're following right now. There are foods that can help you naturally improve your mood. You may already know which foods improve your mood because we all have comfort foods! If your comfort foods are particularly unhealthy, consider finding a different mood-boosting snack that's also healthy. Here is a list of foods to improve your mood based on your symptoms, such as depression or fatigue. You knew that exercise would be on the list. And there's a freaking reason! We all know that exercise releases chemicals and hormones that naturally help you feel better. One of the best exercises to do when you're feeling blue? Yoga. Not only is it great for your mind, body, and spirit, but it's been shown to literally change your brain. Hell. Freaking. Yes. Spend time outside. Not too long ago, I posted about the benefits of going to the beach. Some of those benefits, such as getting your daily recommended amount of vitamin D, can be achieved just by going outside. I highly recommend reading this post about how being outside can make you healthier because it has great information. I could sum it up for you here, but it's a quick read and they say it better than I would! This post was inspired by my partnership with Tobi. When I put on the Eve Short Sleeve Day Dress in Mauve, I felt amazing. It's comfortable, flattering, and freaking gorgeous! When I was feeling down the other day, I put this dress on, did my makeup, and went to brunch with my boyfriend and his family. We walked along the riverwalk to and from brunch. It was seriously the best combination of mood-boosting activities. Seriously, I included all of them in just one outing! I can't deny that these methods all work for me. I would love to hear what you do to make yourself feel better! When you share your experiences, you're not only telling your story - you're also helping and inspiring others. And you never know when someone needs that inspiration! If you enjoyed this post, pin this image to save it for later and share it with your friends.